The show is held in the Metropolitan Pavilion in Chelsea, and each year a display in the lobby showcases a particular designer or theme. 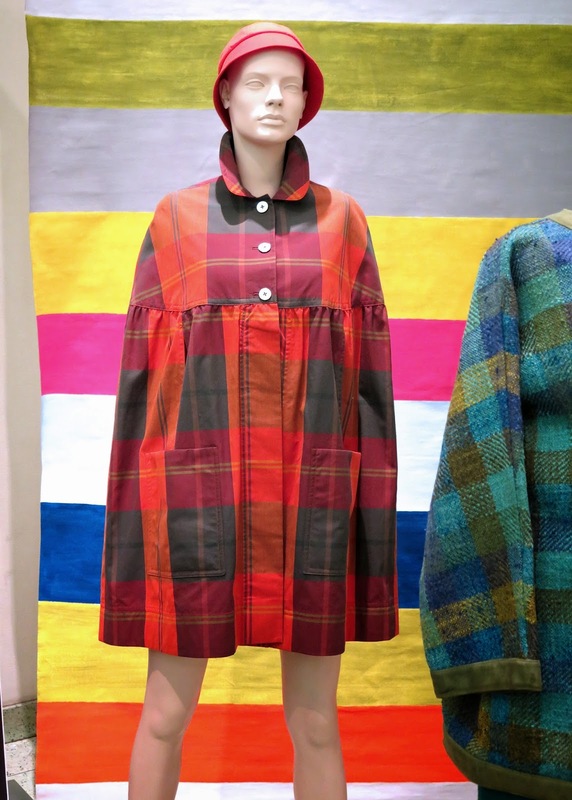 This year's exhibit featured coats designed by Bonnie Cashin, who was known for her pioneering designs in sportswear and use of luxurious natural materials such as leather and mohair. She worked at the clothing and suit manufacturer, Adler & Adler, in New York from 1937 to 1942 and then returned to her home of California to design costumes for 20th Century Fox. In 1950, she returned to New York and in 1951 formed Bonnie Cashin Designs Inc. She designed every item herself, and in 1960, expanded her business to England. She was the founding designer for Coach and also designed cashmere knits for the Scottish Brand Ballantyne ( I have one of her sweaters for that company). Cashin believed that clothing should be as functional as it was beautiful. She was the first designer to use industrial hardware in her clothing and accessories, and attached "Purse Pockets" in coats that didn't already have large pockets in the design. 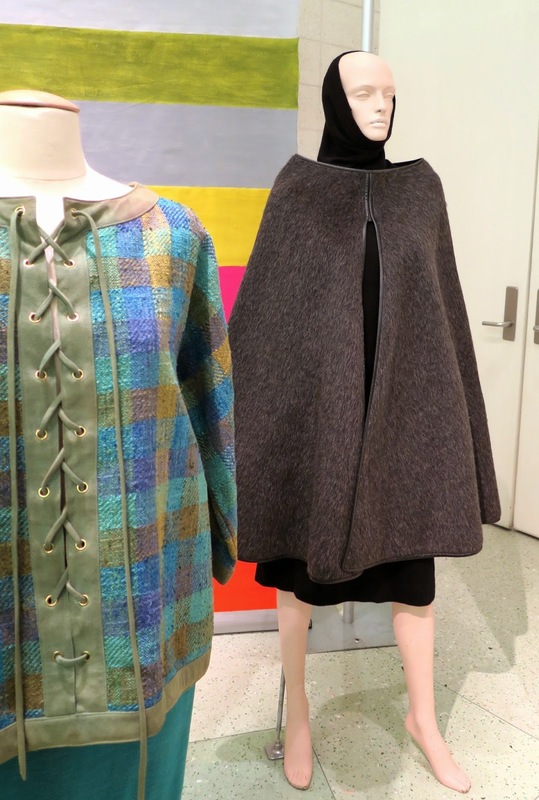 I love the grey poncho/cape on the right with the Cashin trademark leather piping. I think it would make a fabulous skirt if you had a waist that would fit the neckline. Nomad Vintage had acquired a number of hand-painted coats and jackets from a Brooklyn artist and I was especially taken with the funky one above left. It was a heavy cotton canvas and I loved the shape, and the fabric-covered triangle-shaped buttons. 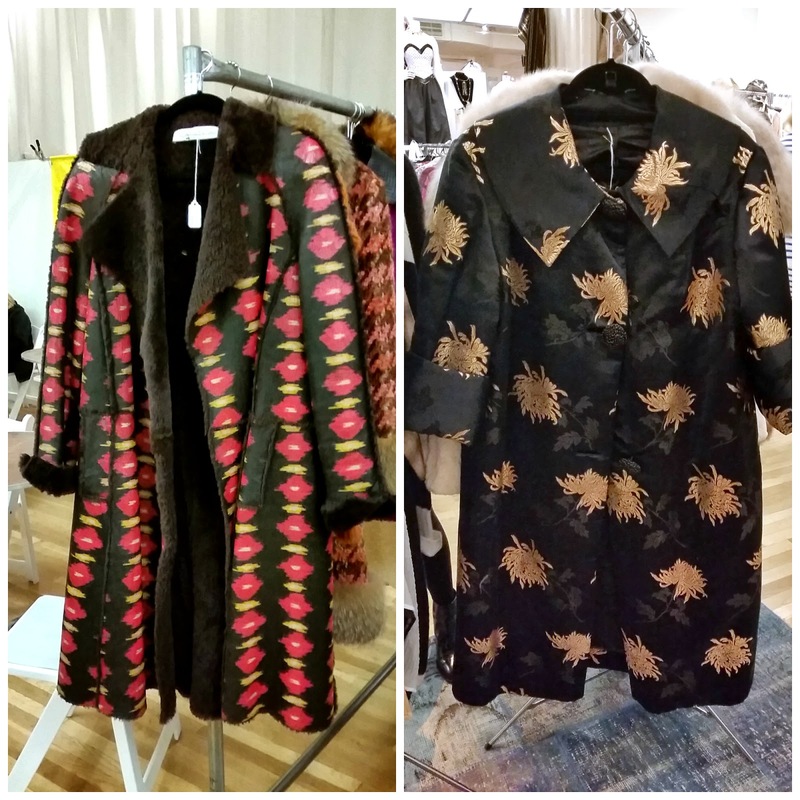 The swoon-worthy tiered and pleated velvet cape on the right was designed by British artist and fashion designer Thea Porter at the Patina Vintage booth. 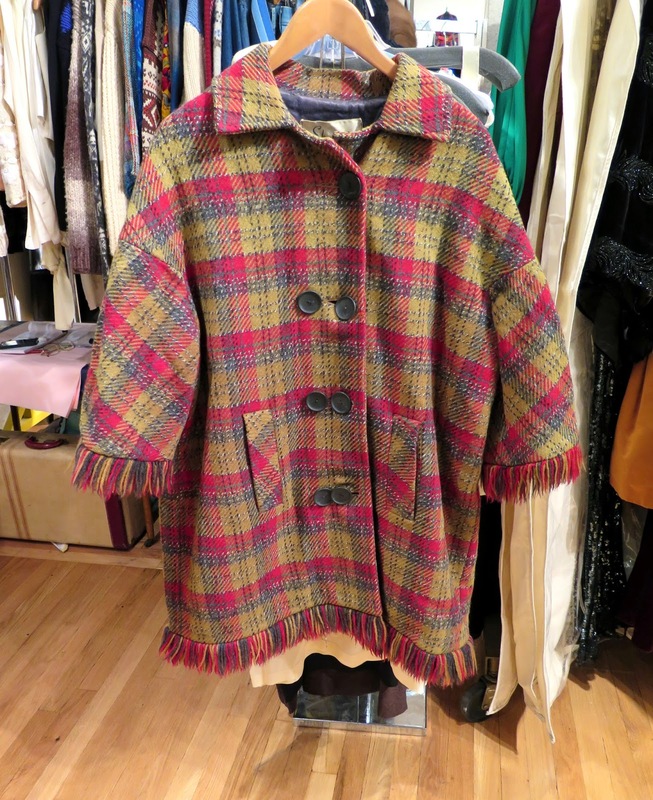 There is a lot of fringe showing up this year and this vintage coat from Olive's Very Vintage in bold plaid with fringe trim would look great with jeans and leather boots. 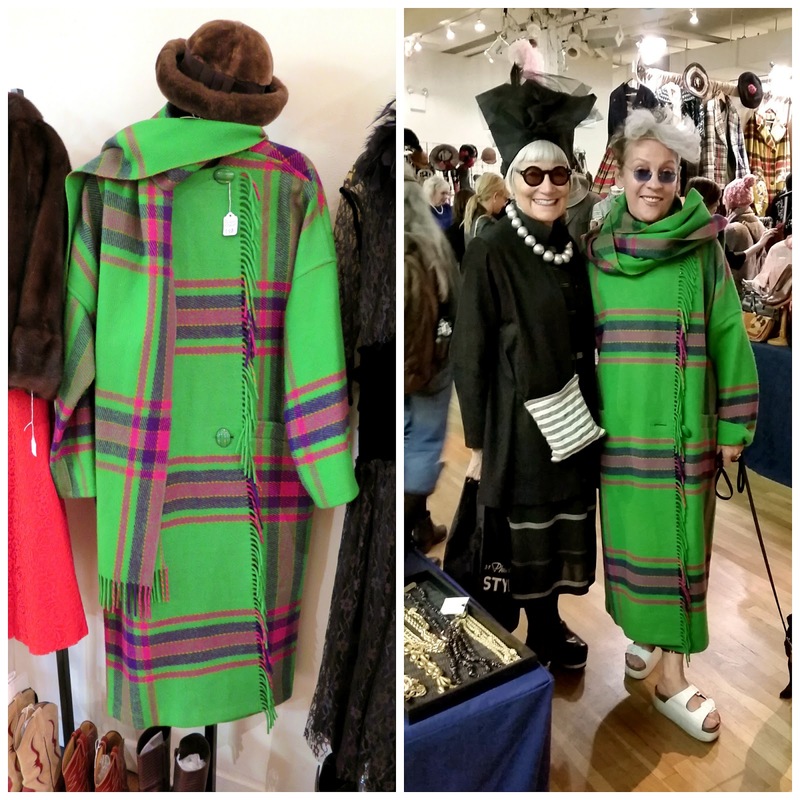 The bold statement coat on the left was at the Marilyn Hitchcock Vintage booth, and it was snatched up by Valerie and Jean's friend Marja Samsom. That's Jean, half of the Idiosyncratic Fashionistas with Marja modelling her new coat. 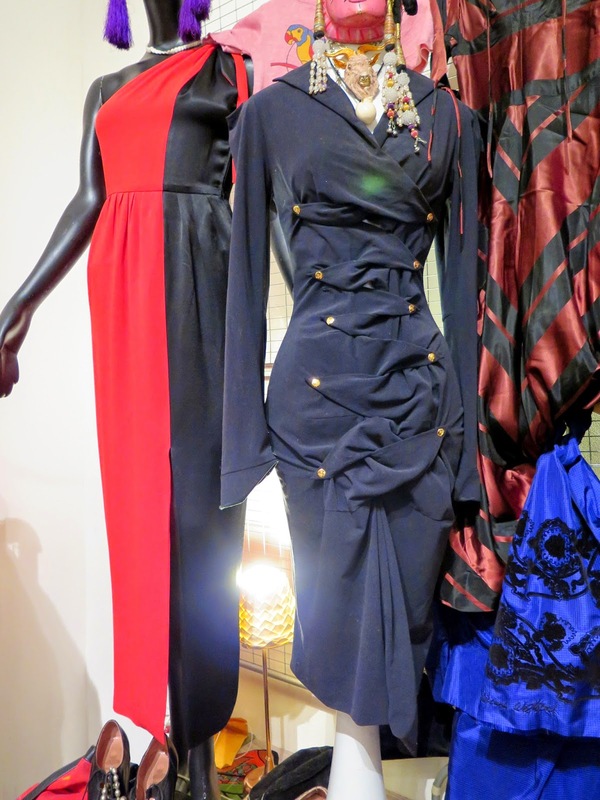 A number of pieces from the recently deceased de la Renta were available at the show. 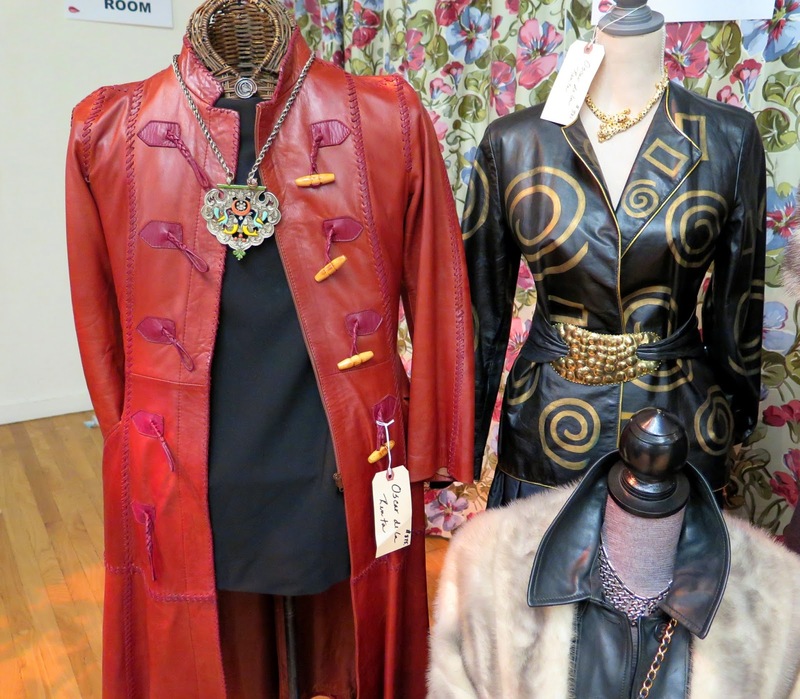 The rust leather coat on the left, and the black and gold one were both his designs, and were available at Pocketbook Vintage. 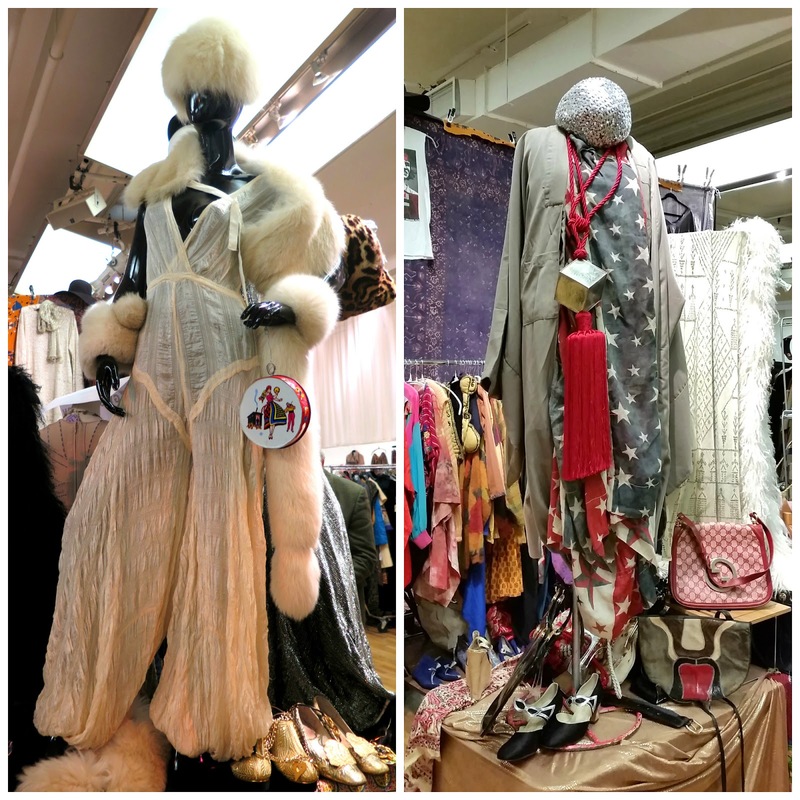 There is no shortage of one-of-a-kind accessories at the show, and I was happy to realize that after four years of attending the show, I'm finally able to admire a spectacular piece of eye candy as wearable art and photograph it to share with my readers, but not feel bad about having to leave it behind. 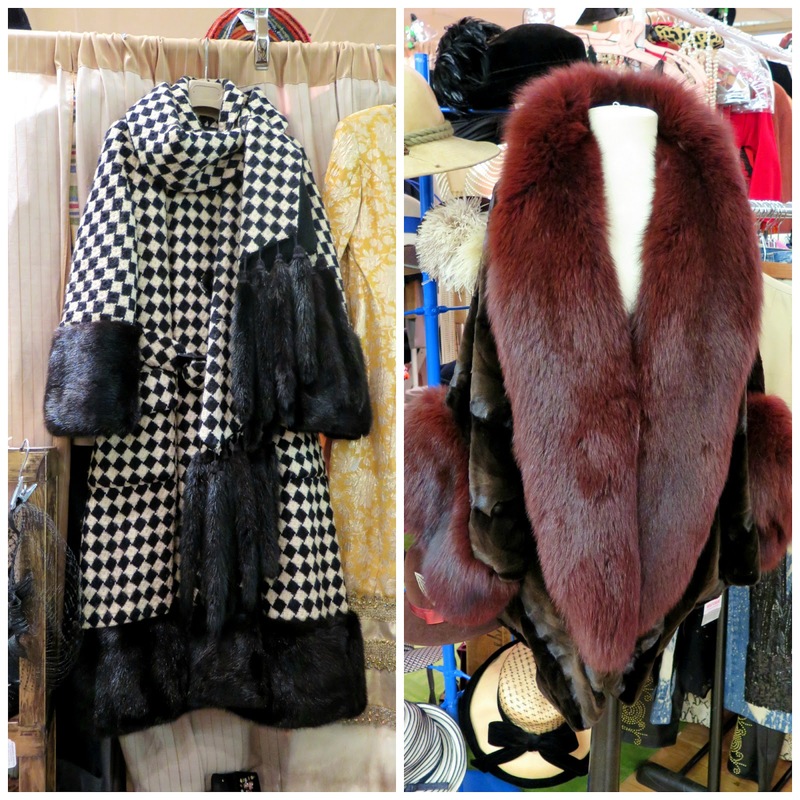 Andrea Hall Levy, owner of Lofty Vintage, always has the best displays at her booth. She has been selling at the show for 10 years, and has a great eye for fabulous pieces that reflect her belief in the importance of self-expression. 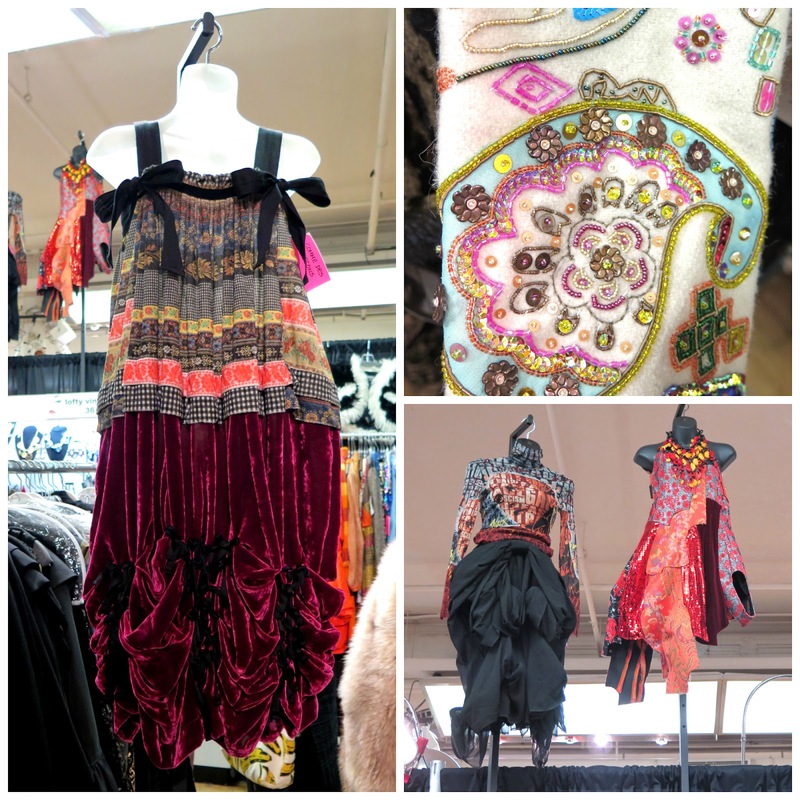 Clockwise from left: Commes des Garcons dress, detail of embroidery on a vintage coat, two outfits guaranteed to make you the most interesting-looking person in the room; all from Lofty Vintage. Nomad Vintage had this very interesting gathered and twisted dress on display. I would have loved to have seen how it looked on a real body. 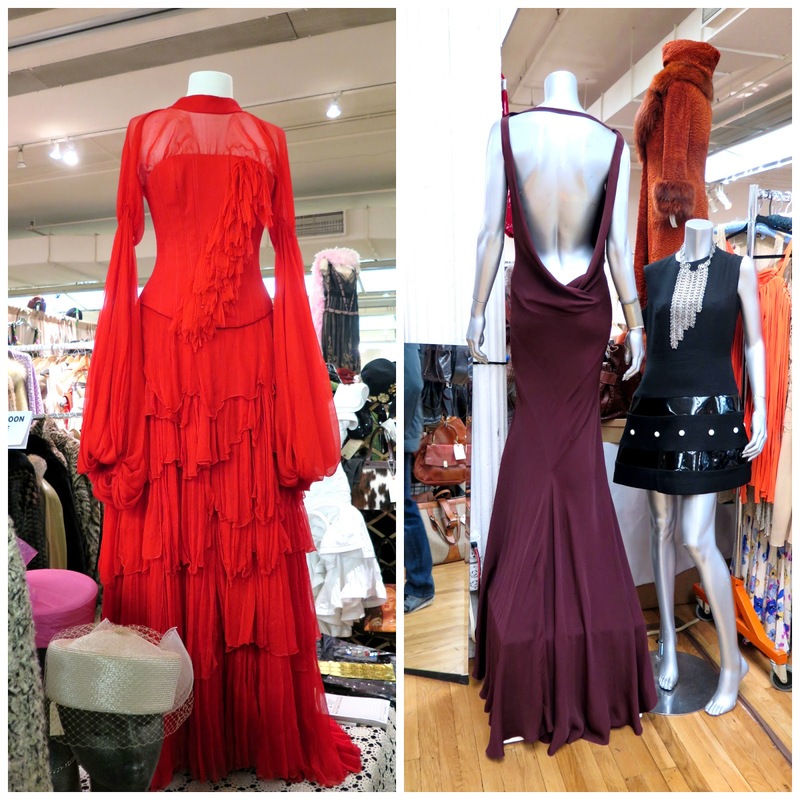 Why make the long walk to the stage in yet another strapless mermaid dress when you could dazzle in the chiffon Frank Lai-designed dress on the left from Sun and Moon Vintage, or leave them gasping for breath in the backless Galliano dress on the right, from Vintage LeMonde? or, you could layer this very rare 1970's pearl jewellery dress designed by Bill Smith over something simple and black and look smashing. Smith was the first African American to win a Coty Award. 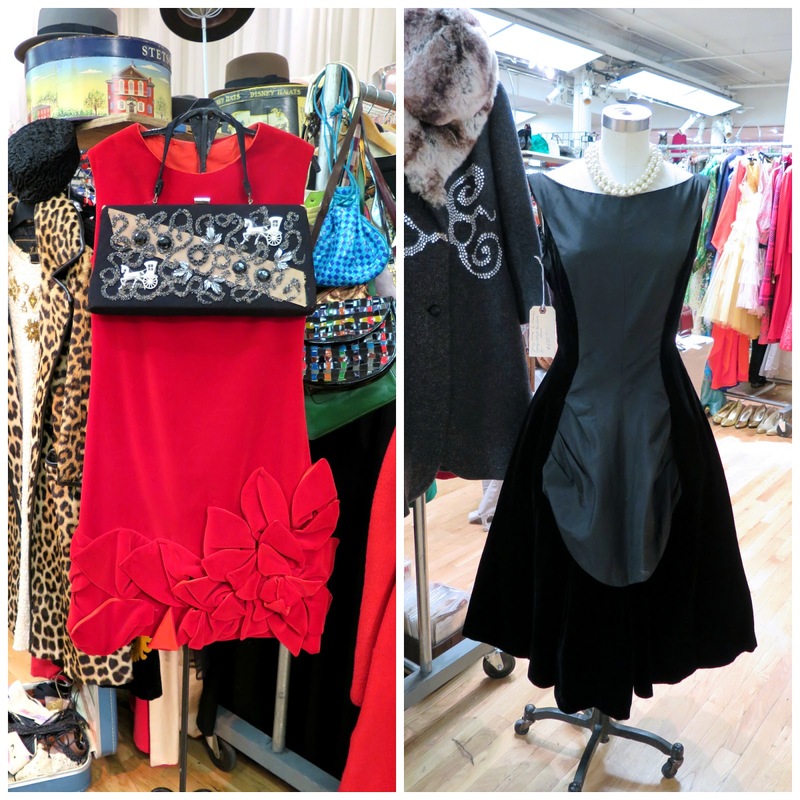 The dress was on display at the Revival Vintage Boutique, which was a new vendor at the show this year. 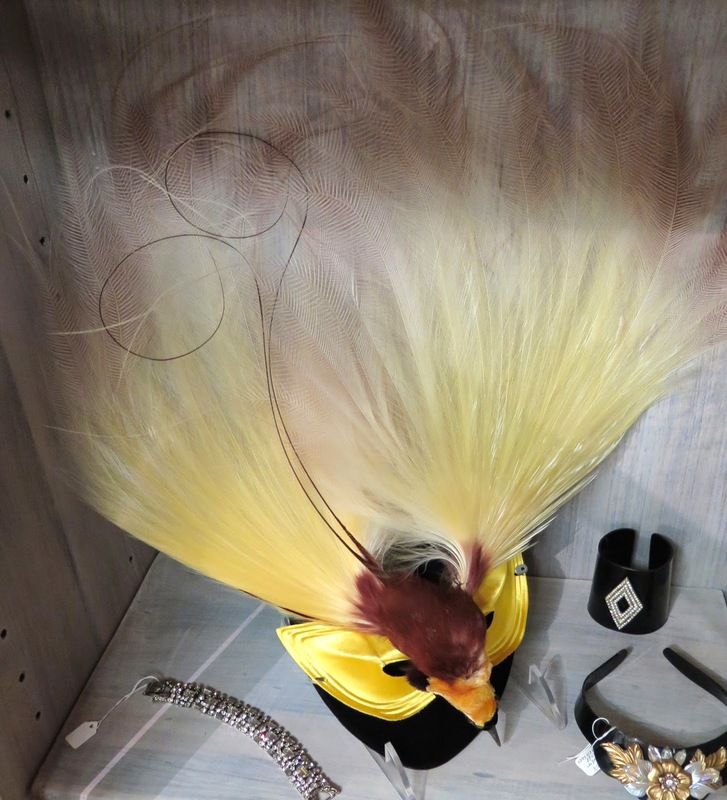 This awe-inspiring bird mask from Revival Vintage Boutique incorporates a real taxidermied bird and would certainly make the wearer the center of attention at any event. This amazing peacock showgirl costume was on display at Another Man's Treasure. When it didn't sell at the show, shop owner Meika wore the costume to a Halloween party and looked stunning in it. And finally, the Manhattan Vintage Clothing Show and Sale is not just about looking at pretty stuff, (although there is certainly a lot of that), you can also learn a lot just by talking to the vendors, many of whom have an encyclopedic knowledge of vintage clothing and the stories behind their treasures. Regina, owner of Vintage LeMonde, explained the story of this WWII souvenir jacket made in Japan. American troops would have these jackets made for them when they were in Japan and the design would be hand-embroidered. In the case of this jacket, it was made for someone who had been on the U.S.S. Kyes. The jacket is not only a gorgeous art piece, but would be coveted by any WWII history buff. I bet you didn't know that The Beatles once had a clothing boutique! The Apple Boutique opened in London (England) in December 1967, and was described by Paul McCartney as "a beautiful place where beautiful people can buy beautiful things". Unfortunately, the business closed after only 8 months, but during the time it was open, a young American woman bought seven outfits there, two of which were on display at the Augusta Auction Company's booth at the show. 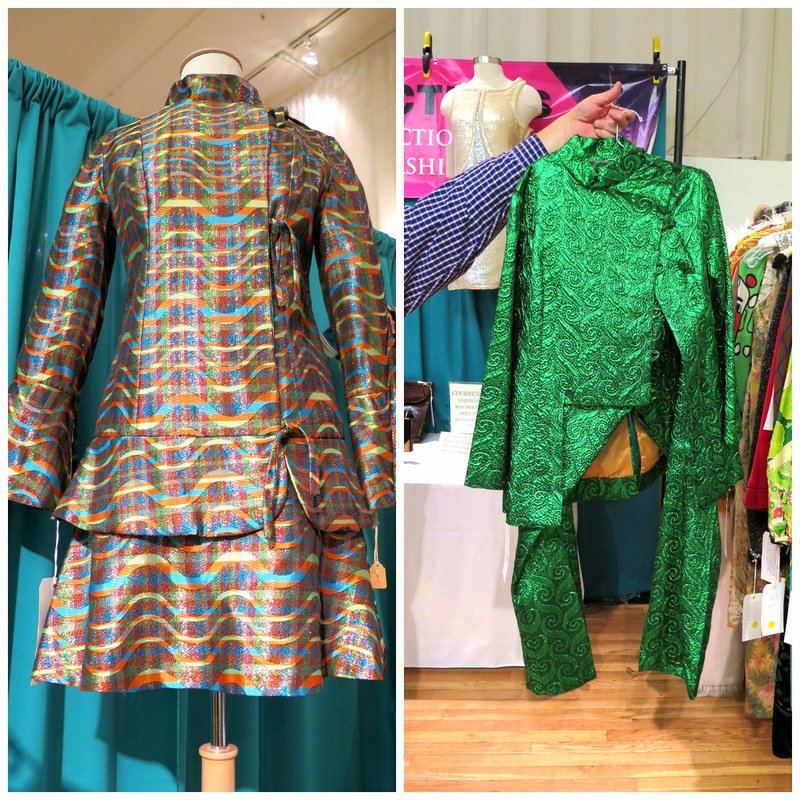 The friendly man working at the booth told me the rather poignant story of how the woman came back to the United States with her purchases, only to be made fun of when she wore the green two piece suit (right hand photo above) in the small town where she lived. She was so embarrassed that she never wore any of the other outfits, which means they are in pristine condition. I felt sad for that woman after hearing the story, as there was obviously something in their psychedelic style that spoke to her, and she wasn't able to enjoy them. 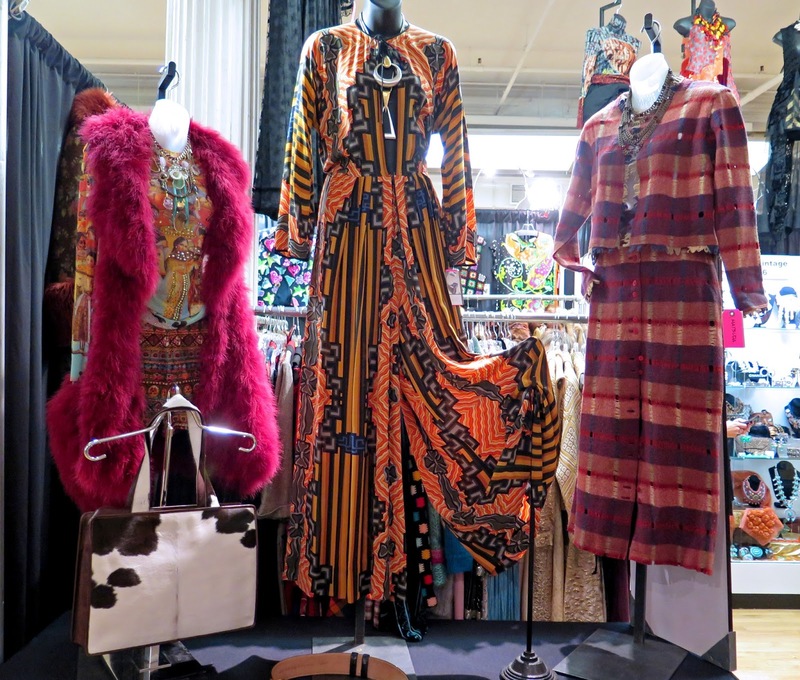 If you are dying to own a piece of wearable psychedelia, the pieces will be offered for auction at the Fall Vintage Fashion and Textile Auction in New York city on November 12th. More information can be found on the Augusta Auctions website. Whew, that was a long post. If you made it this far without having to take a break, congratulations! Part Two will be up later this week, with photos of the stylish folks at the show. That was so cool! I am all over that twisty dress! I want! I want! WOW! You have 21 photos here, and many are twosies or even foursies. Fantastic coverage. I would have had a hard time deciding what to bring home with me. I checked out the Augusta Auctions site and was surprised how many of the lots had low estimates of around $200. Those Apple pieces, though, you pay for the associations. The story about the former owner of that green suit, sad. I knew Vix would have her beady eye on that jumpsuit! The vintage on offer here is very high end, breathtaking to see but presumably with accompanying price tags which would sadly place a lot of it out of my reach... Ah well, we can dream! 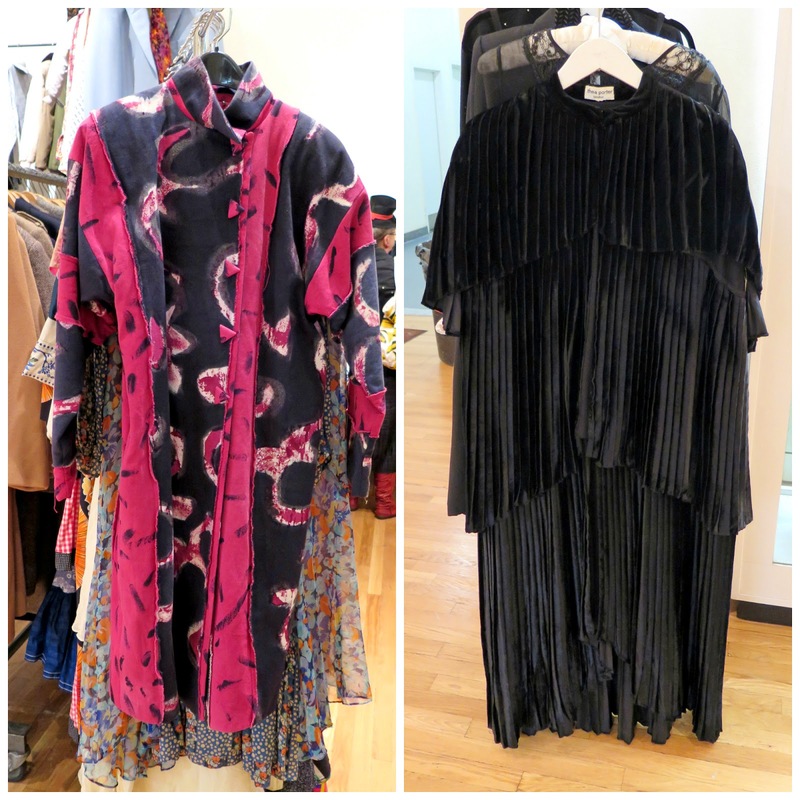 The Givenchy maxi coat and the Oscar de la Renta leather coat caught my eye, as did the Pucci dress. And yes, I did know about the short-lived Apple boutique. 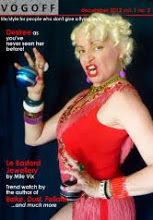 That is indeed a sad story, that the woman who bought those fantastic pieces didn't feel able to wear them. Makes me want to wear as outrageous a psychedelic outfit as possible to compensate! 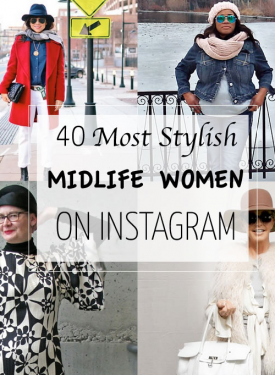 Far too many swoon worthy pieces here to mention. Thanks for doing such a great job of capturing it all. I think it is almost better than me going since I don't risk buying anything. I can't wait for the second post! Thank you for all of the pictures of beautiful clothes! The Givenchy and de la Renta coats are gorgeous! When will we see what you got? I think I just died and went to vintage heaven! Omg I'd go broke here! I am in love with so many things you shared! I think the best part would be being around like minded vintsge lovers! I wish you would have told us the price of each peice, I picture everything bring terribly expensive and that helps leave it behind. I wanna go to this! beautiful clothes, thank you for all the photos. 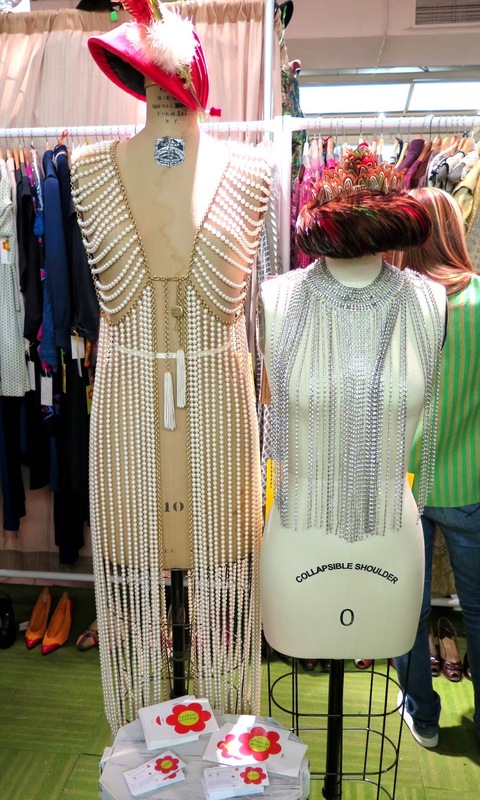 The pearl strand dress was $4500 but that was at the high end of the scale. Most things I photographed were between $100 and $800. 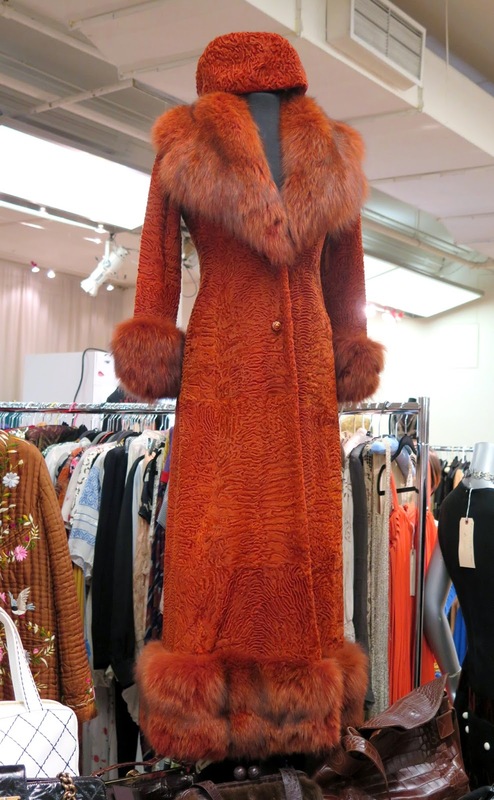 LOVED the burnt orange fur trimmed coat!!! WANT WANT WANT! and the twisted dress and the red "Oscar" dress! Such gorgeous things! I am all about outerwear right now. I'm in awe. Shelley, this post includes so many gorgeous pieces that I would love to posses, but instead, it satisfies me just to gaze in appreciation and swoon! 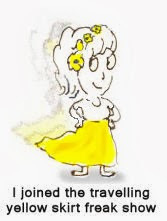 Great information as well, and I can see that you spent a lot of time researching and writing. Thanks for knocking me out! wouuuaaaa, my mouth is watering indeed! !, those coats are amazing (I should pick that black&white one too) and I'm loving all the fabulous stuff, the prints, the designs, the amazing colors!! omg, omg, I had to come back twice, it was all too much for me to take in and then say something too. It still is. All I can say, is thanks so much for sharing all these amazing photos with us and all the accompanying photos. Swooning is the operative word. 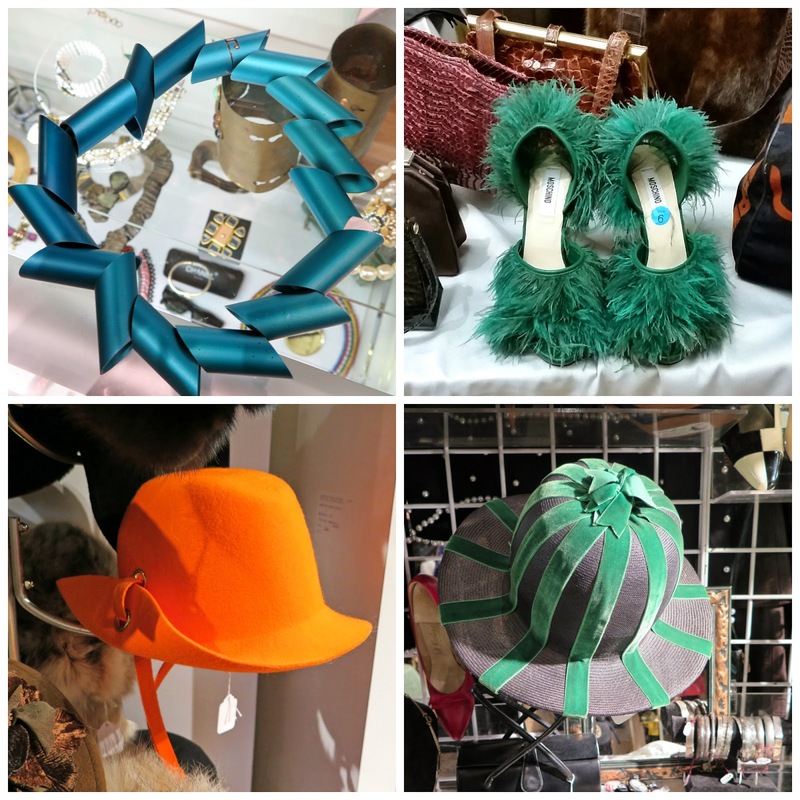 Thanks for photographing some of my items at the vintage show! You did a beautiful job capturing the array of merchandise that was available there!